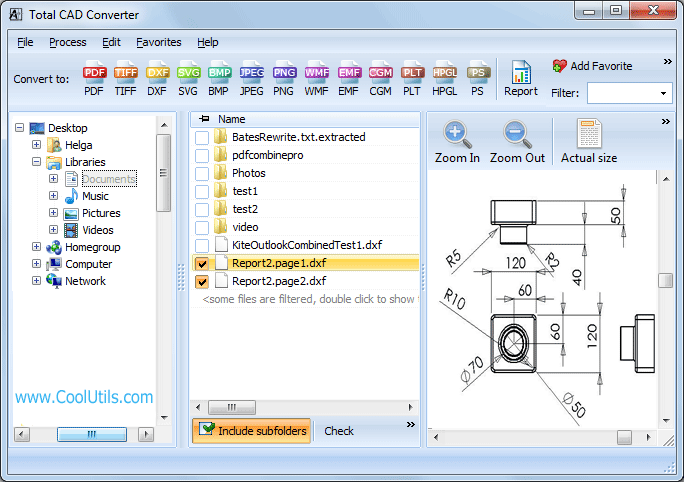 CAD Converter will help you to convert CAD files to tiff, pdf, bmp, jpeg, png, wmf, dxf. Source formats are dwg, dxf, plt, hgl, hg, hpg, plo, hp, hp1, hp2, hpgl, hpgl2, gl2, prn, spl, cgm, svg. The latest version supports Autodesk AutoCAD 2013 files. Total CAD Converter will also resize your files (except for conversion to DXF) so that you get the output file converted and resized to your needs. Besides, Total CAD Converter can combine your CAD files into one document during conversion. If you convert CAD drawings to PDF, you may add a digital signature to protect it. All can be done in batches. You may handle CAD converter via clear user interface or command line. An intuitive interface (take a look at screenshots!) makes it easy even for a beginner to figure out how it works. The wizard of the program will ask you all the questions about the conversion and suggest you most appropriate settings. Besides, it will automatically remember your settings so next time you won't have to make them all again. Right-click option is great when you need to convert a single file from your desktop. Click the file and select Convert To option in Windows popup menu. That is very time saving.